Hugh Ulrich, president of Commodity Center LLC, is one of the world’s experts on the history of international grain markets. 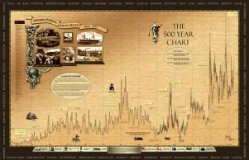 But how to market The 500 Year Chart, how to produce it in a way that would deliver this high-end product at a cost efficient price, and how to fulfill orders were questions Hugh Ulrich brought to SCORE. Like most experts, when he had questions about the best way to be a business that would market a highly specialized and unique new product – a spectacular 500-year chart that traces the history of wheat trading since 1477 – he went to experts in those fields to find the best answers. He went to SCORE. Ulrich’s SCORE counselors were Al Grossman and Jack Navarre from the Chicago office. Over five counseling sessions—both face-to-face and phone—they critiqued and made suggestions about the marketing plan, production (and production resources), fulfillment details and the creation of a web site—the500yearchart.com—that will be the primary marketing medium.